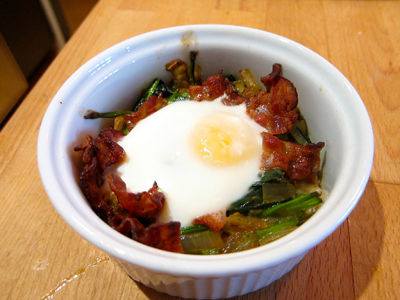 Egg in a Spinach/Bacon (Ramekin) Cup | eat. live. paleo. 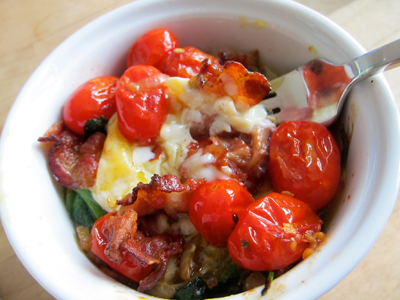 Here’s a lovely way to change up your bacon and eggs, and eat your spinach, too! I recently hoarded bunches of organic spinach, which were on sale… which resulted in finding interesting ways of using all that spinach. 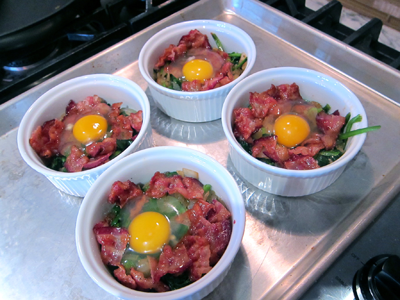 We had some eggs, we had some bacon, so I took out my rarely used ramekins and made these adorable-looking breakfast in a cup (ramekin). David loved it, and can’t wait for me to make it again. I can see more vegetable variations coming up…. First, crisp up a pack of bacon. 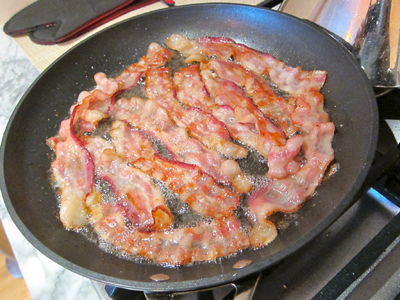 We like Applegate Farm’s Organic Sunday bacon. In a non-stick pan on medium heat, lay out the bacon strips and cook until they are crispy, turning them over so they brown on both sides. Take out the bacon strips out of the pan and lay them out on a piece of paper towel over a plate (this will soak up excess fat and make sure the bacon remains crispy). Drain the fat out of the pan, but don’t wash it — next, we will cook the veg in the same pan (and we don’t mind cooking it in a pan thinly coated with bacon fat)! Chop one large onion and thinly slice 3 garlic cloves. Clean a big bunch of spinach, and chop the leaves into about 1 1/2 inch strips. On medium-high heat, cook the onion and garlic until onions are tender. Add the spinach. 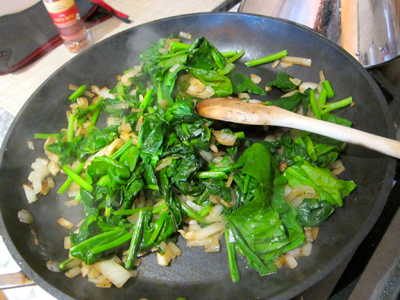 Season with salt and pepper, mix and cook until spinach is cooked. Lay out 4 ramekins in a baking tray. 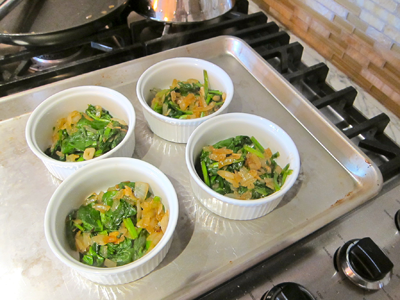 Spoon out the spinach/onion mixture into each ramekin. Chop up the bacon strips into about 1/2 inch pieces. 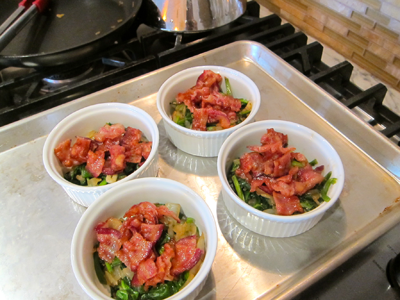 Spoon them evenly into the ramekins, over the vegetables. Put the ramekins in the oven and bake for about 10 minutes. Then, turn the oven up to a medium broil, and cook for about 4 minutes, or until the whites have cooked and the yolk is still runny/over-easy. Cook time would vary between ovens, and, of course, how you cooked you want your eggs. I also pan-grilled some cherry tomatoes and put them on top.